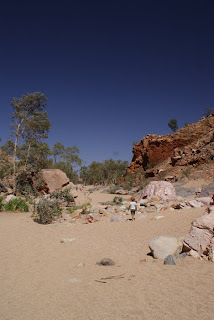 We did not leave Alice Springs until just after 11am this morning after doing some grocery shopping so we were lots later on the road than we had planned for our trip out through the West McDonald Ranges. 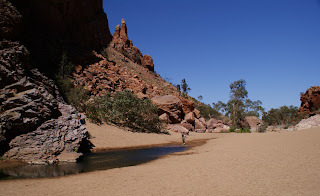 We had planned to camp at Glen Helen and then from there head around the Mereenie Loop to Kings Canyon. I had read lots of conflicting info about the road conditions from rough 4x4 only to unsealed but suitable for conventional cars so we had hoped we could get through that way. But, no. Tim and I were already on our way when Dad phoned the campground and asked. 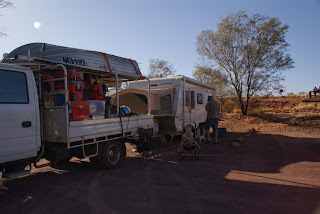 It may have been easier to leave the van behind and do the West McDonalds in a day trip but with the kids it would have been a BIG late day so we decided to camp at Glen Helen anyway and then head back through town on our way south. 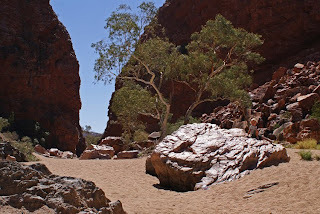 First stop was Simpsons Gap. 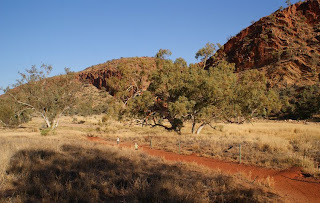 Beautiful scenery and a nice easy walk along the dry riverbed down to the gap in the range to the waterhole. No idea how often, if ever, the river flows or how often the waterhole dries up. Lovely breeze here too which was something we all missed out at Litchfield! We did not go to Standley Chasm. Firstly because of the cost, but also because it was hot and the kids were not in the mood for the 1.5km walk to the chasm. So we kept going to Ellery Creek Big Hole. Had a late lunch and then went for the stroll to the creek. Nice swimming spot! But cold!!!! The kids threw rocks into the water. Darcy tried running in for a swim but I managed to catch him. 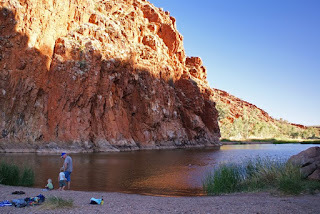 We decided to head straight to the Glen Helen campground and do some of the other sights on the way back out tomorrow. Glen Helen was not all that impressive at first sight, but inside the rough-looking building is quite a nice little bar and a rather flash looking restaurant! Nice atmosphere. The back of the resort looks over the massive sheer wall of the range which is quite amazing. A quick setup and then off for a walk around. We headed straight down the riverbed walk to the gorge and swimming hole. There were some brave souls in for a swim who guaranteed us that is was absolutely beautiful once you were in. And it probably was, once you were totally numb! 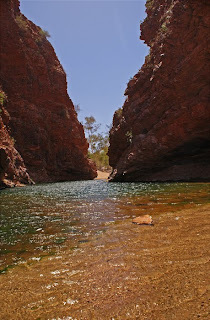 The water hole links on to another waterhole behind the cliff walls and that waterhole gets full sun so is lovely and warm… except that you have to swim though the first one to get to it! So no swimming for us this time. Of an evening the gorge wall looks amazing. It towers above us and covers half of the stars in the southern cross and it glows a little from the reflected light from the back of the bar area. We have a full moon though which is drowning everything out or we would have had an incredible sky full of stars.